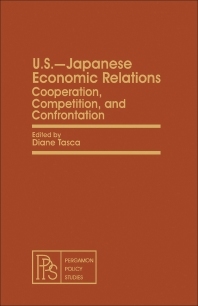 U.S.—Japanese Economic Relations: Cooperation, Competition, and Confrontation provides a comprehensive review of the patterns of U.S.-Japanese interaction. This book describes the tension in the economic sphere that frayed the whole system of connections between U.S. and Japan, including various factors that contribute to these tensions. The ways on how to to reverse the process of estrangement that can lead both nations out of the atmosphere of confrontation and back into one of healthy competition and cooperation is also elaborated. This text also discusses Japan and the United States’ possible developments of policies in pursuit of a rapprochement. This publication is a good reference for students and individuals researching on the sources of confrontation, competition, and cooperation in U.S.-Japanese relations. Chapter 2 Narrow Self-interest: Japan's Ultimate Vulnerability?